BBC World Service - Newshour, What did Trump and Kim actually agree on? What did Trump and Kim actually agree on? The historic summit between US President Donald Trump and North Korean leader Kim Jong-un ended in a joint agreement, which Trump called "tremendous". 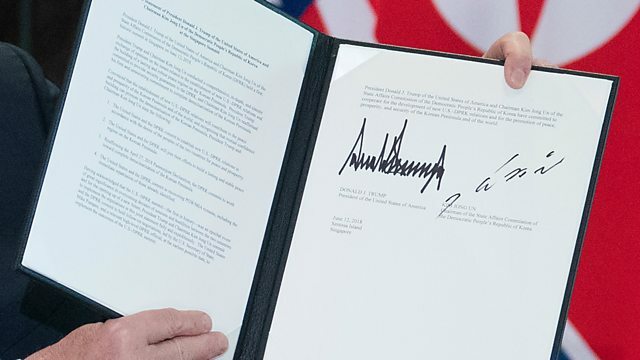 The signed document includes a pledge from both sides to rid the Korean peninsula of nuclear weapons. But what did the two leaders actually agree on? Vipin Narang is an Associate Professor of political science at MIT. He thinks one thing is clear - North Korea is not giving up its nuclear weapons.